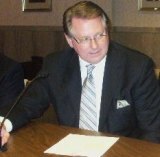 HUNTINGTON, WV (HNN) – After enduring a volatile market partly due to a glut of Recovery Zone bonds nationwide with a December 31, 2010 deadline, the Huntington Municipal Development Authority closed on the sale of $4.692 million in BBB+ bonds for Big Sandy Superstore Arena improvements. At large councilman Steve Williams confirmed the sale at the Dec. 27 council meeting. However, the interest rate came in a little higher than anticipated, so it will be up to council to determine specific expenditures. Williams explained that when the rate came in higher the city reduced the amount of indebtedness so the annual payment would not exceed the amount authorized. The seats and boiler are the priorities. Choices will have to be made, however, on other aspects of the plan, such as a new plaza confinement or infrastructure choices, such as the ice machinery that would be necessary for either indoor ice skating, ice shows, or a possible team franchise. Although the actual rate of the bonds have an interest at or near 8-8.5%, when the federal interest match is included, the city will pay only about 4.4%. A portion of the issue refinances the outstanding indebtedness on the Jean Dean Municipal Building and the BSSA. Williams told HNN that due to the higher than expected rate the savings on those items will be negligible. Council’s finance committee will meet Monday, Jan. 3 at 6:30 p.m. with a four item agenda, including a report from Finance Director Deron Runyon on the actual revenue and expenditures for November 2010.